Trapped In Trees By Tigers, Men Rescued After Five Days : The Two-Way The Indonesian men caught a tiger cub in a snare meant for deer. Other tigers heard the cub's cries. One man died after his branch broke, tossing him to the ground, and the tigers attacked. The other five managed to hold out — and hold on — until help arrived. 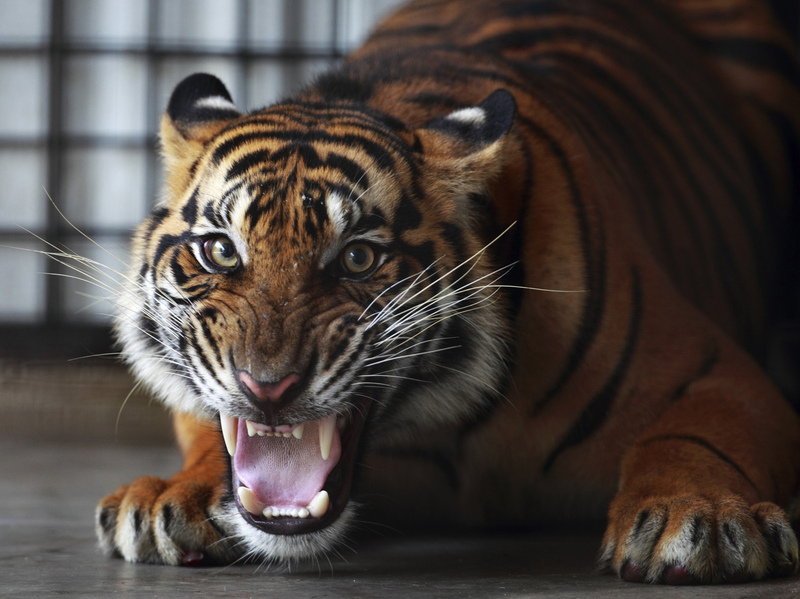 Five days after they fled up into trees to escape a streak* of at least four Sumatran tigers, five men were rescued Monday in the wilds of Gunung Leuser National Park on Indonesia's Sumatra Island. According to the BBC, dozens of rescuers were able to drive the tigers away so that the men could come down. Earlier, the Jakarta Globe had reported that "a 30-member team entered the 7,927 square-kilometer national park on Saturday after villagers' attempts to rescue the men were thwarted by the site of four Sumatran tigers near the base of the tree." It took the team a couple days to reach the men. "[They] were attacked by tigers on Thursday after they caught and killed a tiger cub in a snare meant to catch a deer, police said. Nearby tigers drawn to the scene of the injured cub and pounced on the men, killing and eating 28-year-old David as the five others climbed a tree to safety. "The residents of Simpang Kiri village entered the national park after the men called for help on their cell phones. But as the villagers neared the tree, the site of four large tigers and David's partially eaten remains kept the rescue party at bay." The unfortunate David, says The Associated Press, reportedly fell to the ground when his branch broke. That's when the tigers attacked him. Now, writes the BBC, "Andi Basrul, head of the national park, said the survivors were being transported to the nearest village, which normally takes six hours on foot. Jamal Gayo, from the conservation group Leuser International Foundation, said the five were weak after not having had food for three days." The World Wildlife Fund, by the way, says there are fewer than 400 Sumatran tigers left in the wild. They are "holding on for survival in the remaining patches of forests on the island of Sumatra." From March 2011: VIDEO: Wild Tiger Cubs At Play. *Streak: Yes, a group of tigers is called a streak, according to this list posted by the U.S. Geological Survey's Northern Prairie Wildlife Research Center. We also see that such a group can be called an ambush of tigers. We're not seeing, though, any explanations for where "streak" and "ambush" come from regarding tigers. We bet some Two-Way readers, know. Feel free to tell us in the comments thread.